For a few years after the first settlers moved into the valley there were no real roads there, only trails made by wagons cutting a track through the woods and fields. Gradually the trail over Mt. Scott was widened and improved by the people living in the valley. They used road scrapers drawn by horses to do this work. This road was terribly steep, very muddy in winter, very dusty in summer. In some places it was impassable in very wet weather, so it was improved by having logs placed side by side across it in those areas. This was called a "corduroy road" and was pretty rough to travel over. Later, this road was graveled, but not until 1915. About 1900 John M. Deardorff felt that there should be another way out of the valley besides the difficult road over Mt. Scott, and he persuaded the county commissioners to have a new road surveyed and built going north to Foster Road. He also helped with the building of this road and it is now called "Deardorff Road." At first wagons were the main means of transportation. As the roads got better some buggies were used and finally, carriages. The first automobile in the valley was owned by a family called "Pearson" and was purchased by them in 1915. Telephone lines were extended into the valley in 1908 and the first telephone installed. In the fall of 1925 electricity was brought in. Some of the "old timers" remember this date very well because it happened just before Christmas and they put electric lights on their Christmas tree instead of the dangerous lighted candles. The dates of the first radio and television set are uncertain. 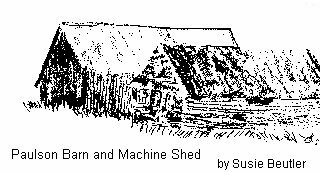 By the time these inventions were common, so many new families had moved into the valley that several may have appeared at the same time. After World War II, or about 1946, a central water system was built and homes were then able to have modern bathrooms and kitchens. Sewage disposal was by means of privately owned cesspools. A fire department was established soon afterwards when Happy Valley received its charter and was constituted a city. Its population is now over one thousand people. The Deardorff family built the first home in the valley in 1852. It was constructed of logs and there was just one room with a large fireplace at one end. This room, with the attic above, sheltered the family until more rooms could be added. This they did from time to time until the house contained as many as four rooms. 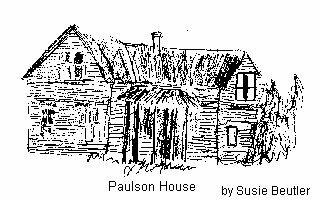 Much later this house was replaced by a frame house built in the style of the houses of that day, in two stories, with about four rooms below and two or three rooms above, with a large attic above that. A few of the first frame houses in the valley also had basements underneath. A well was usually dug as near the kitchen as possible so that water would be close at hand. Several of the old frame houses are still standing and most of them are still occupied. 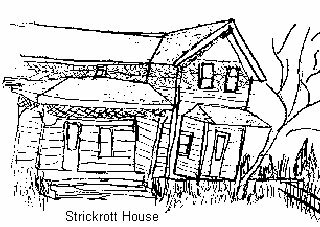 Mr. Archie Strickrott and his wife still live in their home at 12510 Southeast Mt. Scott Boulevard. George Zinser built the house just east of the fire station. This was the first plastered house in the valley. In 1901 Charles Rebstock bought that place and lived there for several years. It is now occupied by others. 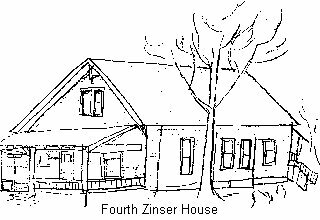 Fred Zinser's first home was a log cabin on Mt. Scott built in 1890. 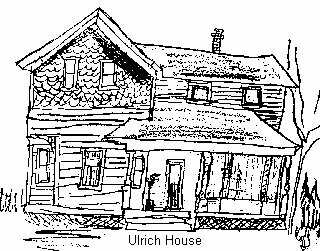 This was the birthplace of Elmer, Royal, and Lydia Zinser, all of whom still live in the valley. Later they built a large home on the site of the present Kirk Cooper home. When this house burned down another was built in its place. Finally, this one was moved down Mt. Scott Boulevard a little way to make room for the new Cooper home. The Eberlin's now live in the large Zinser home. One of the early settlers, Mr. Harden, donated some of his land for a church, the corner of 132nd Street and Southeast King Road. (Editor's Note: Should this be 129th and King?) The first building was frame, consisted of just one room, and was put up in 1891, and its denomination was Evangelical. There was no resident pastor. Every Sunday a minister from Lents walked over the mountain to hold services in the church . An interesting incident concerning the church is told by one of the descendants of the early members of this church. As the story goes, the language used in the services was English at first. Then, several German families moved into the valley and became members of the church. Soon all the services began to be held in the German language. This continued until the Rebstock family came. Mr. Rebstock was asked for his opinion about the language. He replied that since this was an English speaking country to which all of them belonged the services should be in English. His opinion was respected and the services were in English from that day on. From the very beginning the settlers needed a place to bury their dead, and such a place was found near the summit of a neighboring knoll now called "Scouters' Mountain." The first to be laid in it was an unknown man who had arrived in the same wagon train with the Deardorff's and who died in 1852, shortly after reaching the valley. John M. Deardorff donated five acres of his land on the mountain for the cemetery, only one acre of which has actually been used. This is where twenty-seven graves, mostly of the Deardorff's and their relatives, are found in a fenced off area surrounded by a wilderness of tall trees, and adorned by clumps of wild flowers in springtime. Most of the headstones have been restored; a few had to be replaced by newer ones. The first grave is that of the wagon pioneer, the last is that of Edith Guidi, 1932. Twelve of the graves are of children and infants. Prominent, old fashioned headstones mark the resting places of the original pioneers: Christian and Matilda Deardorff, John M. and Rachel Deardorff, John Bennet and Clara Deardorff. The cemetery has been closed since the burial of Edith Guidi. It can be reached by means of a trail leading down from the Boy Scout Lodge on top of the mountain and by another trail from the approach road to the lodge. The pioneers were very much interested in the education of their children. For the first few years, however, children had to go to Rock Creek or to Sunnyside to school. In 1891 John Bennett Deardorff donated an acre of his land for a school. 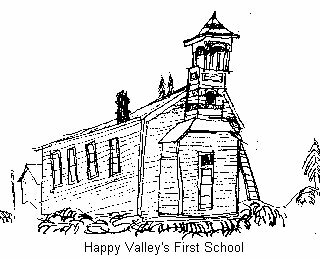 A small one room frame building with a steeple on top was constructed in the same place where Happy Valley School is now located, on Southeast King Road. Mr. Deardorff also got a large school bell made and had it put up in the steeple. Rachel Deardorff made the first American flag for the school. It contained forty-four stars at that time. Inside the schoolroom two small cloakrooms were built near the front door. The teacher's desk stood on a raised platform at the other end with a door on either side leading into the yard. Students' desks were double and were screwed to the floor in two long rows leaving a middle aisle. A large wood stove stood in the middle of this aisle and kept the room warm in winter. Water had to be brought in a bucket from a nearby spring, and everyone drank from the same dipper. Two outdoor toilets were built behind the school, one for boys and one for girls. The only playground equipment were homemade seesaws. One teacher taught all of the grades from one through eight in one room. The total number of pupils averaged about forty. Some were as young as six years, and occasionally one was as old as twenty-one. This was because some older bays and girls who had not had an opportunity to go to school when they were younger wanted to go to school to learn to read and write . The first teacher was Mr. Lonnie Brooks who taught for one year. Between 1892 and 1930 there were twenty-seven teachers in all. Most of them came from outside the valley. A few of them boarded with families in the valley while they were teaching. In 1930 Miss Mabel Scott began to teach and remained at the school until 1955 - a long record! The original school building was replaced by a larger one in 1917. A basement containing a wood burning. furnace was added, also a covered playshed in 1921. In 1936 a wing containing a stage was put on. Two more classrooms were added in 1952 and another two in 1956. Finally, in 1960 the main part of our present school building went up. This section was built of brick. In 1967 the latest addition of the school was added, the north section containing the fifth and sixth grade classrooms. ORIGIN OF NAME: "HAPPY VALLEY"
The valley was referred to as a "Hollow". Boys from the "Hollow" enjoyed drinking Grandpa Deardorff's delicious apple cider before attending church services at Sunnyside and often used to arrive there singing loudly and gaily. Sunnyside dwellers were soon referring to them as "The happy boys from the Hollow," and after awhile the area became known as "HAPPY VALLEY"